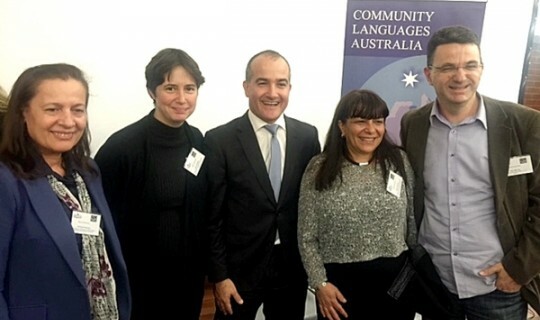 On Monday April 11, 2016 Community Languages Australia (CLA) and the Ethnic Schools Association of Victoria (ESAV) held a Meet and Greet event at the Drill Hall in Melbourne with the Deputy Premier and Minister for Education the Hon James Merlino. Over 200 teachers, parents and students attended. Minister Merlino in his address expressed the Victorian State Government’s support for community languages school. He reinforced the message that the State Government has a strong commitment to languages and that the Government would continue supporting this important partners in education. He indicated while he is no position to release State Budget details (which will be released in late April) he was hoping he and Minister for Multicultural Affairs would be able to make some funding announcements soon. The Minister also presented certificates to successful teachers and instructors who completed the Certificate IV in Community Language Teaching course, including Greek Community of Melbourne’s teacher Ms Poppy Kouroupis. This special event was also attended by Greek Community’s Vice President Mr Theo Markos and Board Member Ms Vasso Zangalis.